The 18-hole First/Second at Laguna Woods Golf Club in Laguna Woods, CA is a private golf course that opened in 1964. Designed by Harry & David Rainville, First/Second at Laguna Woods Golf Club measures 6070 yards from the longest tees and has a slope rating of 116 and a 69. The 18-hole First/Third at Laguna Woods Golf Club in Laguna Woods, CA is a private golf course that opened in 1964. Designed by Harry & David Rainville, First/Third at Laguna Woods Golf Club measures 5718 yards from the longest tees and has a slope rating of 114 and a 67. The 9-hole Par-3 Course at Laguna Woods Golf Club in Laguna Woods, CA is a private golf course that opened in 1977. Par-3 Course at Laguna Woods Golf Club measures 989 yards from the longest tees. The course features 2 sets of tees for different skill levels. Greens and fairways are bent grass. 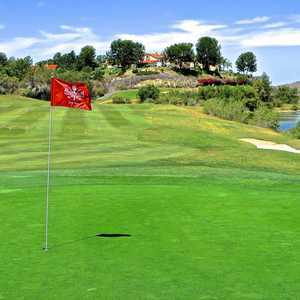 The 18-hole Second/Third at Laguna Woods Golf Club in Laguna Woods, CA is a private golf course that opened in 1964. Designed by Harry & David Rainville, Second/Third at Laguna Woods Golf Club measures 5574 yards from the longest tees and has a slope rating of 114 and a 66.